PHOTO BY NICOLE WALBY Betsy Struxness, who was part of the cast of “Hamilton” when it began as “Hamilton Mixtape,” speaks Monday at Tiffin University’s Celebrating Cultural Uniqueness event. It wasn’t until after leaving the Broadway hit “Hamilton” that an original chorus member realized the production’s impact. 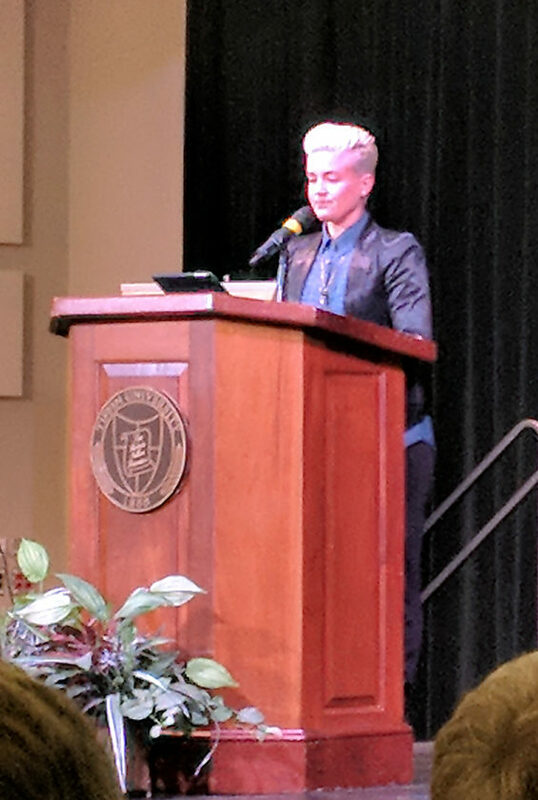 Betsy Struxness, a performer and photographer based in New York, was keynote speaker at Tiffin University’s inaugural Celebrating Cultural Uniqueness event Monday. Struxness is known for her performances in “Wicked,” “Memphis,” “Leap of Faith,” “Scandalous” and “Matilda,” but her biggest honor was bringing “Hamilton” from the workshop to off-Broadway to Broadway. Struxness said she had decided to refocus her career and take a break from theatre when then titled “Hamilton Mixtape,” came along. Struxness said the more she looked at the show, the more enthralled she became by it. After auditions and call-backs, along with performing in “Matilda,” she was offered the workshop. She practiced day and night. “The things you do for the love of art,” Struxness said. While a production usually has 12-18 songs for the chorus, “Hamilton” had 50 songs, she said. Struxness said chorus members constantly were memorizing songs, choreography, prop changes, wardrobe changes, stair and platform changes and more. She said many of the other actors also were performing in other shows, as she was. Struxness said she was performing in three shows a day during the workshops. Once “Hamilton” hit the public theatre, Struxness realized the power the production had, with celebrities attending, and the praise it received. “Once it opened, it began to move fast,” she said. At that time, Struxness said she was dealing with a “stressed out body” and burnout. She said she had to plan her life around the show and make sure she was healthy enough to do the show. When the show made it to Broadway, she said there was excitement, but also a lot of pressure and less joy trying to be sure the show lived up to the hype around it. “I was finding it hard to be happy and light,” she said. Also, Struxness did not land an understudy role and she decided it was time to leave the show. Struxness said her final show was the most fun she had since its start. Struxness said “Hamilton” impacted people for different reasons. Struxness said she began to read the news more, voice her opinion and support her friends. She said it is important to give your voice to others.